The Rt Hon. 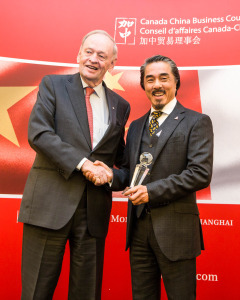 Jean Chrétien (L) congratulates Sandy Chim (R), President and CEO of Century Iron Mines Corporation, on receiving the 2014 Gold Business Excellence Award for Chinese Investment in Canada from the Canada China Business Council. On November 28, 2014, Century was honoured to receive the Gold Business Excellence Award for Chinese Investment in Canada from the Canada China Business Council (“CCBC”). The award was presented at the CCBC Annual Gala Luncheon held in Toronto. The Award recognizes Century’s history of success in solid Canada-China cooperation. It comes at a crucial moment in Century’s history. Ms. Karen Lee, former CFO of the Hong Kong Exchanges and Clearing Limited, has recently joined Century’s board at the September 2014 AGM as a director and Chair of the Audit Committee. In the recently published MD&A attached to its second quarter results, the company announced its new strategic direction to increase shareholder value. Century intends to broaden its public and institutional shareholder base in China through a new trading platform, the Shanghai-Hong Kong Stock Connect linking two of the world’s most important stock exchanges, which officially opened on November 17, 2014. “We are very honoured to receive this Award. I would like to recognize our Chinese strategic partners’ investments in Century and our projects, and the unwavering support they have extended to us over the years. This has allowed us to build a company with a strong balance sheet and set our projects on the path for success. Without the involvement of WISCO, Minmetals and their teams, we would not have won the Award,” stated Sandy Chim, President and CEO of Century. The Canada China Business Council is the country’s Canada-China bilateral trade and investment facilitator, catalyst and advocate. Founded in 1978 as a private, not-for-profit, non-partisan business association, CCBC provides unparalleled insight into Sino-Canadian trade and investment issues and develops connections that ensure its members’ business success. In addition to its focused and practical services, the Council is also the voice of the Canadian business community on issues affecting Sino-Canadian trade and investment.